This is a well-known painting by Jean Paul Lemieux, since it was presented in 1967 at his Retrospective Exhibition at the Montreal Museum of Fine Arts, the Musée du Québec and the National Gallery of Canada. It was reproduced in the catalogue published for that occasion. Lemieux had often said that he attached as much importance to his paintings with people as to his landscapes. 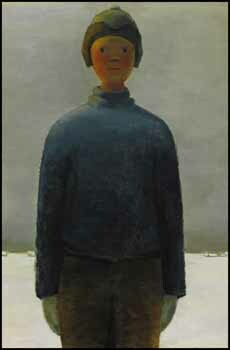 Ti-Gus, 1962, could be said to belong to both genres, since it represents a boy in front of a typical Lemieux horizontal landscape with a grey winter sky. Obviously Lemieux was attracted by the idea of creating characters rather than portraits of specific individuals. Ti-Gus could be described as a typical French Canadian boy (Ti in Québécois stands for petit and Gus, for Gustave). This is probably the reason why no family name is given to the boy. He is known only by a nickname, not by a surname. This remark applies to other Lemieux paintings. One thinks of the famous Julie et l’univers, 1963, for instance. If we except portraits of important personages, like the Queen of England, the Pope, or Cardinal Léger, most of his people are characters. Even if we feel that he is full of life, Ti-Gus stands still, like a soldier, with his arms alongside his body and his back straight. Often Lemieux’s people are inactive, standing in front of the landscape doing nothing in particular, just being. I have often thought that Lemieux had a philosophical mind and was expressing the very idea of Heidegger’s dasein, to be there, the there (da) being the almost empty landscape, with few habitations dispersed along the road (or the coast), which had struck him when he came back from a trip to France in 1956. But Ti-Gus’s lack of activity has another significance. It reflects a certain renunciation of action. The very fact that one finds so many children among Lemieux’s people is not insignificant. By definition, children are not yet in the real world. We protect them from it, and let them live in a universe of their own. This is true also of other people in Lemieux’s paintings like the old couple of Les noces d’or, 1966, or L’orpheline, 1956, L’enfant de choeur, 1957, La servante, 1966, or Le petit frère convers, 1971. Like the people of Chaim Soutine’s paintings - the first communion girl, the cook’s helper or the altar boy - they belong to the margins of society, if not to a lumpenproletariat. They will not be a source of change in the society in which they accept both the rules and the limitations. Like 19th century characters in novels - and one could say that, taken as a whole, Lemieux’s people belong to the universe of the novel, like Charles Dickens or George Eliot characters - they have renounced their desire and do not contest the rules, even if they were crushed by them. Ti-Gus is a nice boy, but he is not completely happy. His face expresses some worry, his future is uncertain and the bleak landscape behind him is not very hopeful either. But, at the same time, how endearing are these Lemieux characters! Because of their archetypal nature they become a source of identification for everyone. Lemieux always strived for the universal, wanting to be as far as possible from any particularism, to the point of being astonished, or even embarrassed, to have been called “le peintre québécois par excellence”. It is true that one could find a Ti-Gus anywhere there are children, snow and winter. We thank François-Marc Gagnon of the Gail and Stephen A. Jarislowsky Institute of Studies in Canadian Art, Concordia University, for contributing the above essay. The consignor will donate the proceeds from the sale of this work to Canadian charities.